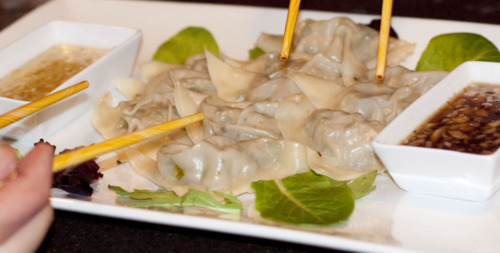 Make gyoza isn’t that hard… as long as you have an army of wonton stuffers on hand. Luckily I did one night and me and my gyoza-slaves made an asian feast. To make the stuffing just mix a pound of ground pork, a few tablespoons of chopped cilantro and chopped green onion, 1 tablespoon of diced ginger and garlic, an egg, and 1 tsp of seasame oil. For the wrappers just buy 2 packs of wonton wrappers. To make the stuffing extra-flavourful let it sit in the fridge for a few hours. We did not plan that far in advance however - they were still good. 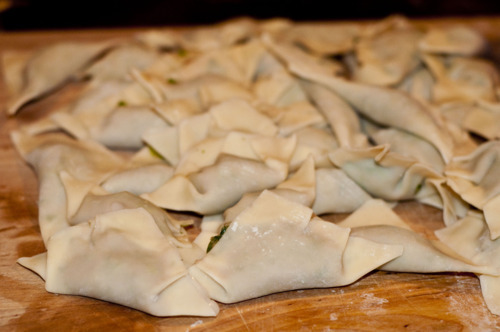 To assemble mix an egg white with a bit of water - spread this mixture on the edge of a wonton wrapper, place a tablespoon of stuffing in the middle, and squish the wonton wrapper closed. Next comes the steaming. I got this steamer from a asian grocery in town. 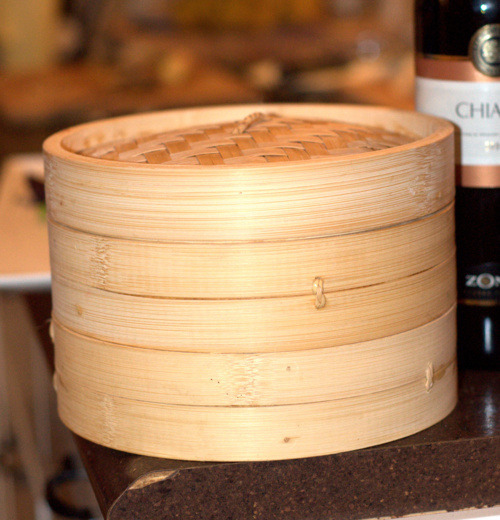 Line the steamer with pieces of parchment paper or cabbage leaves or else the dumplings will stick to the steamer (yes, I’m speaking from experience). Bring a pot of water to a boil and then place the steamer over the water for 6 minutes. 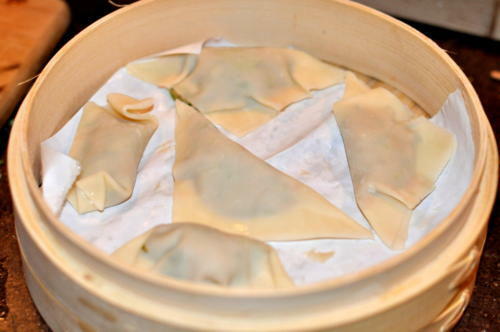 You’ll have to make the gyoza in small batches unless you have a bigger steamer. To make the dipping sauce simmer together a 1/2 cup of rice wine vinegar, a few tablespoons each of sugar, garlic and ginger. We added soy sauce to one dipping sauce and left the other plain. Serve on cabbage leaves (or spring greens if it’s the only thing in your fridge). Combine all ingredients in a bowl and let marinade for 2 hours. Simmer ingredients together until sugar is disolved. 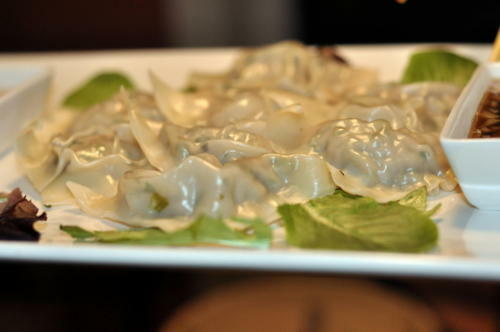 Stuff wonton wrappers with pork mixture and glue together with egg white and water mixture. Steam dumplings in batches for 6 minutes.